This is an icon. The purpose of this image is to help us practice our faith. The picture has text that names each person. This is because the painting is not supposed to be beautiful, it is supposed to guide us, to help us understand our relationship with Mary and the Catholic Church. An icon has a very clear, concrete, meaning. 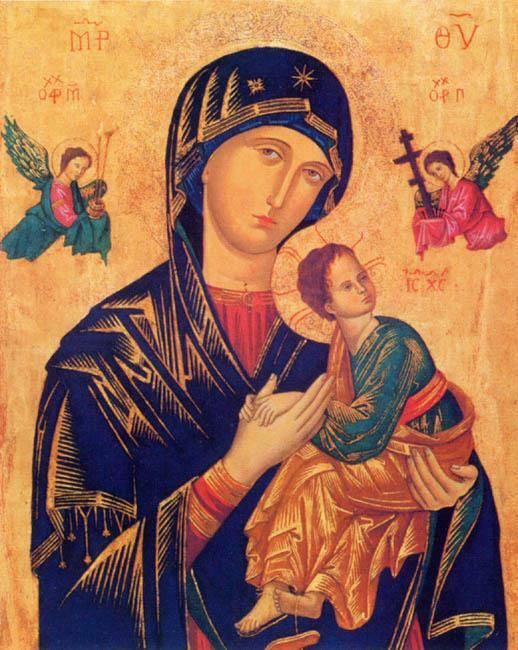 Our Lady of Perpetual Help shows us that Mary is always here to comfort and protect us, just as she comforts the baby Jesus when he sees how he will die. Can you remember some of the ways the icon shows this? We also looked at Sengai’s “Circle Triangle Square.” This painting is also like an icon, but it comes out of a different religious tradition, Zen. The image is very abstract. It expresses and idea for us to try and understand ourselves. The Catholic icon presents us with an image to pray to and venerate. Unknown. (13th Century). 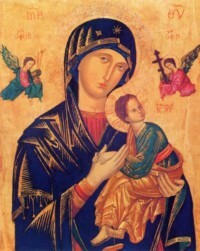 Our Lady of Perpetual Help. Rome. Esquiline Hill.